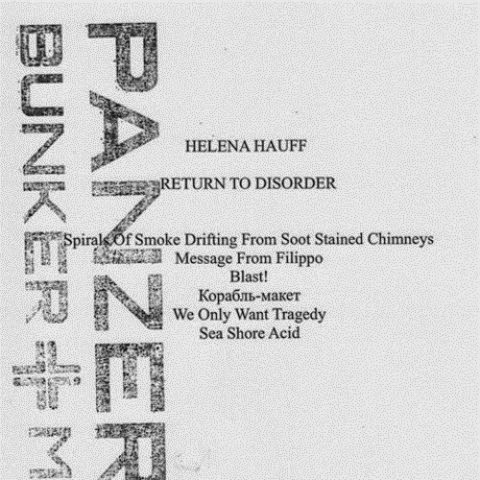 In recent times Hamburg’s Helena Hauff has been sighted twice on Bunker’s hawkish offshoot Panzerkreuz. As a member of Black Sites she appeared on a split EP with Ghettogem and now the Dutch label’s number 1028 features a ruff solo effort by Fräulein Hauff. The guys behind early Bunker tools have found a sister in arms when “Return To Disorder” is essentially about dirty ghetto drums and blistering acid lines. A six-tracker with total playtime of 35 minutes qualifies for a mini-album and offers great moments to those who know. The tracks span from rough sequencing of “Spirals Of Smoke Drifting From Soot Stained Chimneys” to rude stomper “Message From Filippo and to “Blast!”, which feels like sitting in a car currently showered in a car wash station. The catharsis arrives with daunting 303 cut “Sea Shore Acid”, serving as a shark alarm to expel all sunbathers.